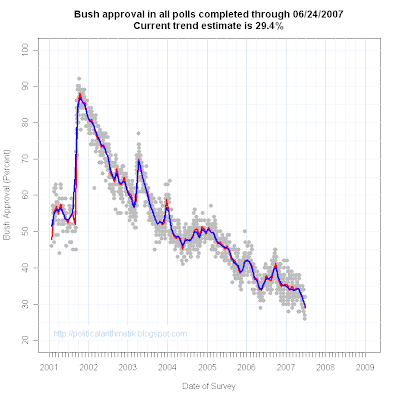 The new Fox poll taken 6/26-27/07 pegs approval of President Bush at 31%, disapproval at 60%. With this addition, my trend estimate of approval stands at 29.5%. 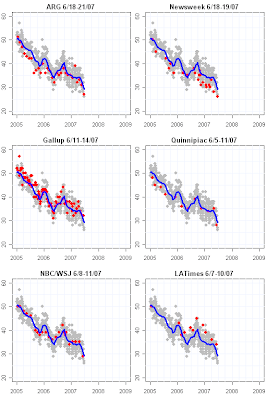 The diagnostics show well behaved data so little to be suspicious of at the moment. 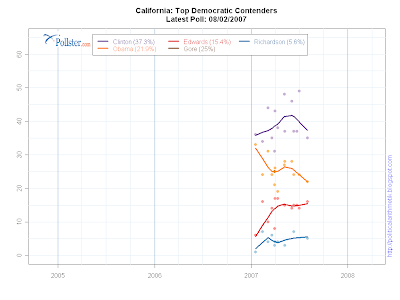 Starting today I'm adding Bill Richardson to the Top Democrats charts for both state primaries and the national nomination polling. 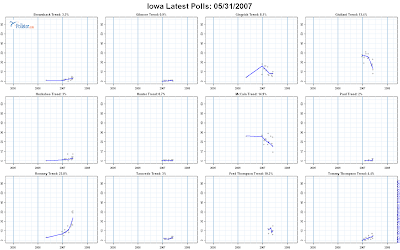 The graph above shows his substantial movement in Iowa, and New Hampshire looks quite similar. 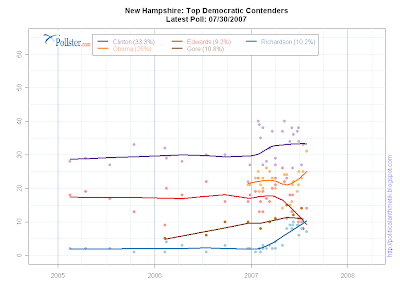 While Richardson is still in fourth place in both states (5th in NH if you include Gore), his is the only trajectory that is clearly moving up. So it seems fitting to start watching it with each new poll. 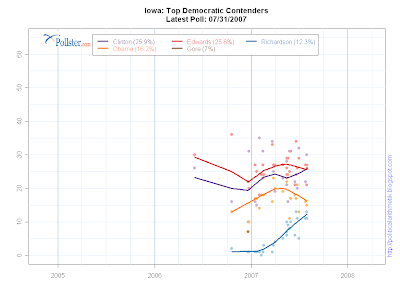 Richardson's movement is substantially concentrated in Iowa and New Hampshire, so when I include him elsewhere, you might wonder why I'd call him a "Top Democrat." 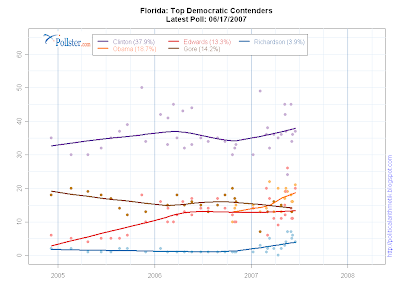 See Florida below for an example. Here Richardson has edged up just a little bit (to 3.9%! ), but certainly not like the move he has made in Iowa or New Hampshire. But that is EXACTLY the point. By seeing what he is doing everywhere, we can track how his movement in the earliest states compares to how he is doing in the rest of the primary and caucus states. 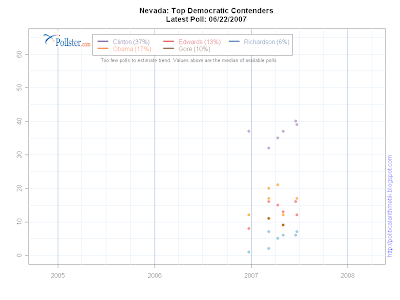 If I left him out of the "Top Dems" everywhere except where he is doing well, you'd have no comparison across states. Likewise, I'm adding him to the national Top Democrats plot for the same reason. 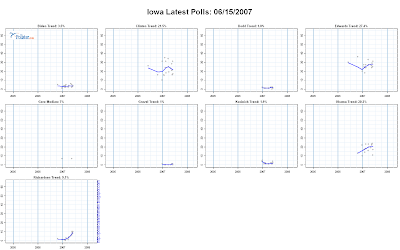 As you can see below, his moves in Iowa and New Hampshire are completely invisible in the national polling. And again, that is exactly the point. 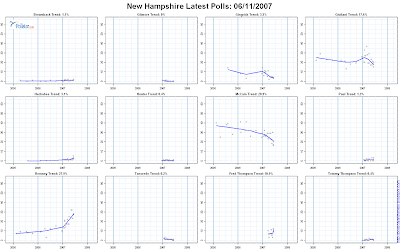 When you see his campaign move in early states but not others and not nationally, you see the variation in strength and the possibility of future growth elsewhere. But not if I leave him out of the plots. 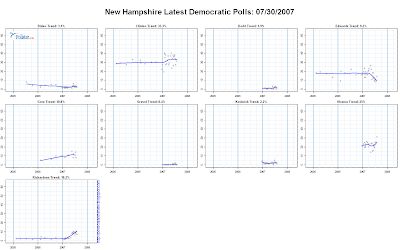 For other Democratic candidates, we've not seen a substantial upturn anywhere. Richardson stands alone in that respect at the moment. 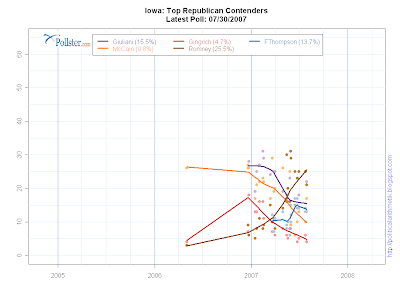 Of course, I'll continue to monitor the top candidates and make additions (or perhaps deletions!) as developments warrant. 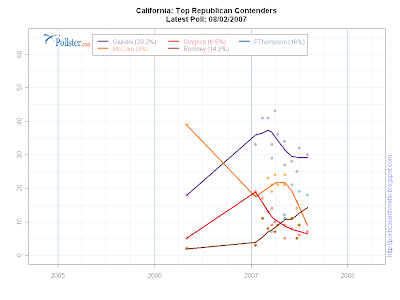 This post is updated in place with the latest state polling results. See the links to state primary polls in the column on the right. Or click on the label: "State Primary Polls" for all posts on this topic. 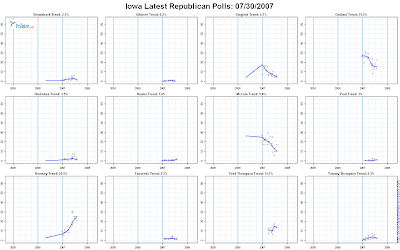 Some of these graphs are large. Click once or twice for full resolution. 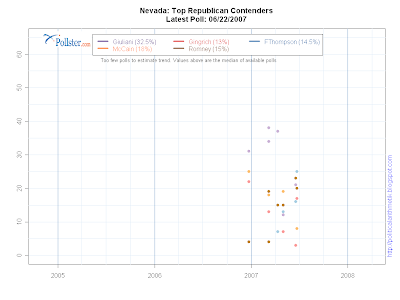 Also see the state pages at our partner site Pollster.com for extended coverage of the state polling. 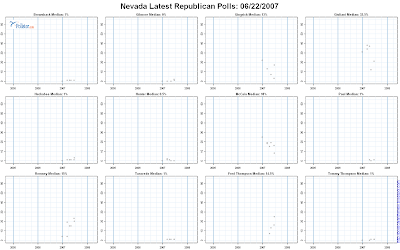 There you can see the underlying data and a "zoomed" view of 2007 polling only. 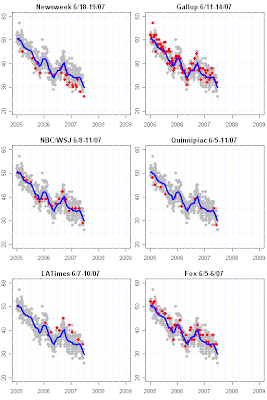 For some technical details, and some warnings about the trends here, see this post at Pollster. 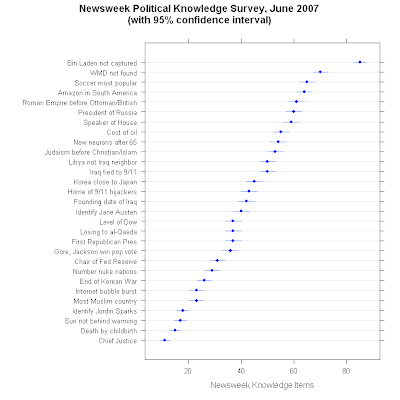 Newsweek has a new "what you need to know" survey out this week. (Article, Results). 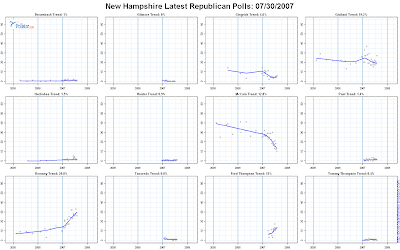 The headline, "Dunce Cap Nation", pretty well captures their summary of the data. Of the 29 items, only a quarter found more than 55% of the public giving the correct answer. Half the items had between 29% and 55% correct, and a quarter fell below 29% correct. (Though defenders of American culture might note that the fourth lowest percentage correct was being able to name the winner of American Idol (A: Jordin Sparks). ) And while the lowest single item was the ability to name the Chief Justice of the Supreme Court, both Speaker Pelosi and President Putin made it into the top quarter of awareness. From what you know about the situation, do you think the United States is losing the fight against al-Qaeda or radical Islamic terrorism? just might be considered a tad political opinion and not so much objective fact. But while Newsweek is primly aghast at such public ignorance, I doubt any college teacher would be. Knowledge is remarkably compartmentalized. In areas of interest, students are able to develop stunning depth of knowledge, while outside those interests the acquisition of new knowledge, and the retention of what is acquired (say, for the midterm), is quite meager. And what is the impact of this? Most of us, most of the time, lack the foundation for and the motivation to do independent analysis of political problems outside our narrow areas of expertise. Instead we rely on political leaders with whom we think we agree to lead us. We accept and repeat the arguments that come from our side, and we reject out of hand the arguments that come from the other side. Seldom is independent knowledge and judgment involved, even as we repeat what we've heard and think we are expressing an informed opinion. And that is as true of the Jane Austen scholar who offers political views as it is of the polling expert who opines about budget policy. Outside our narrow expertise, we seldom form original opinions. A new American Research Group poll, taken 6/18-21/97, finds approval at 27%, disapproval at 67%. 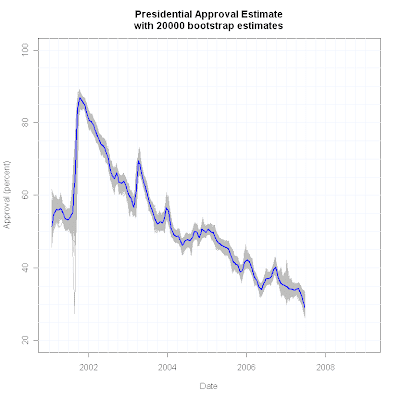 This puts the approval trend estimate at 29.1%, continuing the decline that began in late April. This is in line with Newsweek's 26% and NBC/WSJ's 29%, and is within range of Gallup's 32%, the three most recent polls. My post on the Newsweek result yesterday is unchanged by this result. None of the recent polls is an outlier, all falling within the +/-5% confidence interval around the current 29.1% estimate. 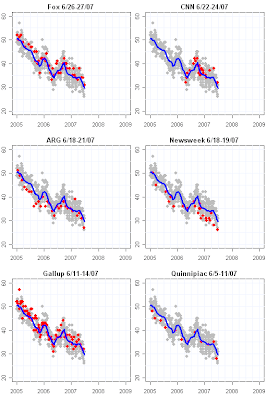 By popular request, I've added a plot to my standard approval post contents: The fourth graph contains both the standard "old blue" trend estimate, which is more likely to be correct in the long run but which is slower to detect change, and the "ready red" estimator which catches change quickly but is easily mislead by random noise that isn't actually a change in trend. Now you can see both as part of these posts. The blue line is plotted second, so when the red agrees closely with the blue estimator, the red line is covered up by the blue line. So where you can see red at all is where the estimators disagree. Otherwise red and blue are tracking together. Given that agreement among polls, it is not surprising that the outlier analysis finds nothing to complain about. 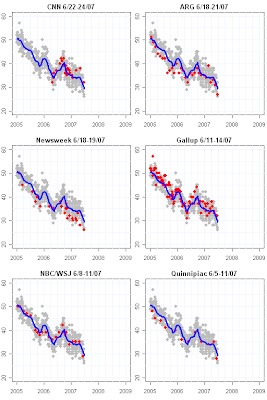 The confidence interval around the trend estimate is approximately +/- 5%, so Newsweek at -3.9% is well within that range. 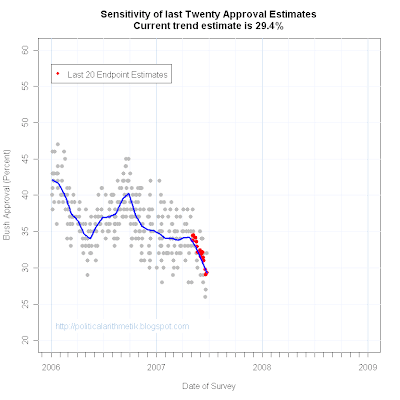 The trend over the last 20 estimates has been unrelentingly downward. Despite the long stability in approval from December through mid-April, the trajectory of approval has been dramatically down since April 23. Newsweek headlines "How low can he go?" We looked at that a while back in this post. One of the keys I pointed out then was the support presidents enjoy from their own supporters. 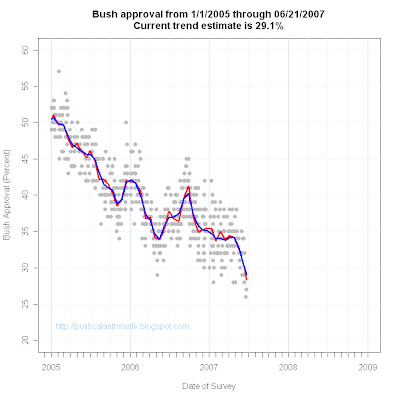 Past unpopular presidents have suffered a substantial loss of support from their party. President Bush has been a significant exception to this. 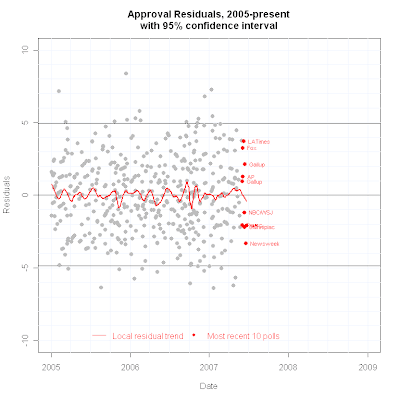 His lows among Democrats and independents have not been accompanied by similar declines among Republicans. When the post was written in March 2006 approval stood at 38%. 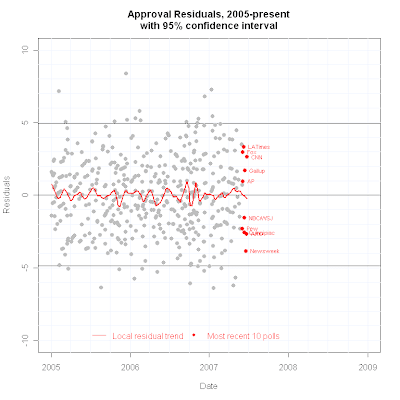 Approval among Democrats was 10% back then while independents reported 27% approval. These were much lower than history would predict for a president at 38%. 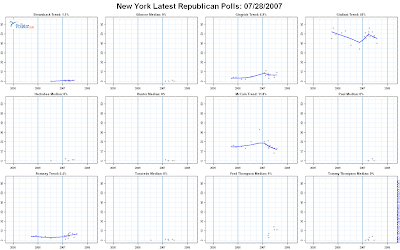 The huge difference was that Republican support in March 2006 was an amazing 82%. Because approval among Democrats is so low, further declines there can make little difference to the overall level. Independents could matter a bit more, but how low approval ultimately goes is going to depend on Republicans' willingness to continue to stand by the president. Michael Bloomberg's possible entry into the presidential race appears to hurt Giuliani more than Clinton, based on analysis of data from SurveyUSA's recent polling in 16 states. 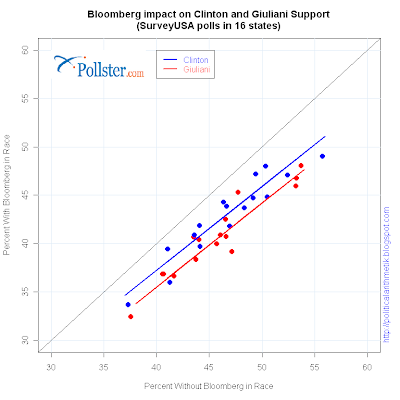 While support for both candidates declines when Bloomberg is included in the vote question, Giuliani's support declines by an estimated 1.7 more percentage points than does Clinton's. OK, now imagine that the election for president was a 3 way contest, and the 3 candidates on the ballot are Republican Rudolph Giuliani, Democrat Hillary Clinton, and Independent Michael Bloomberg. Adding a third option to any vote question should be expected to draw support away from both candidates in the two candidate only form. 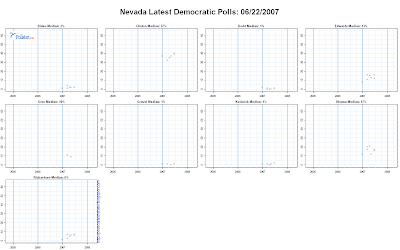 In the figure above, that means we would certainly expect the data points to fall below the black 45 degree line in the figure, meaning candidates do worse with three candidates than with two. That obviously occurs in the figure. 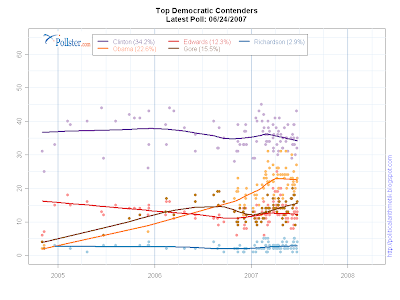 The differential impact on the candidates is the more crucial point. If both candidates are equally affected, we'd expec the red and blue points in the figure to mix together more or less randomly in the plot. 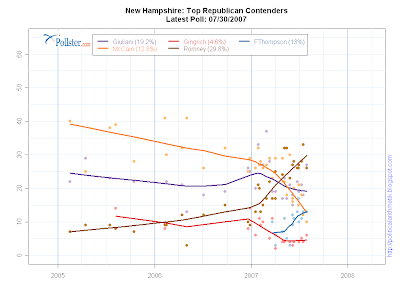 If one candidate is more damaged than the other, then the blue and red points should separate with one generally closer to the 45 degree line than the other. That's what we see. Generally the Clinton (blue) points are above the Giuliani (red) points. 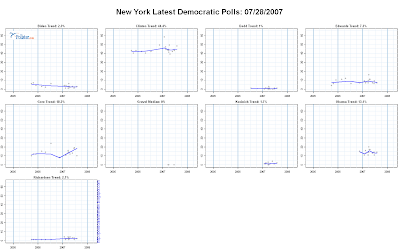 If we take the simple average changes, Clinton loses an average of 3.6 points when Bloomberg is added, while Giuliani loses an average of 5.2 points. When we do a slightly fancier regression estimate, the net loss hurts Giuliani by 1.7 points more than it does Clinton. That difference is visible in the chart as the gap between the red and blue estimated regression lines. As a Republican until this week, Bloomberg could be expected to draw more from the Republican than the Democratic candidate. Of course this is all hypothetical with a mayor who says he expects to serve out his term. 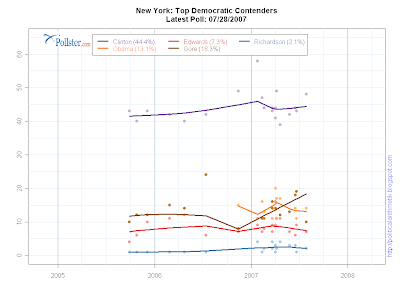 But you have to admit that an "all New York" three way race would have its charms.